Kids & the Young at Heart love the thrill of Laser Skirmish. Laser Skirmish is a perfect choice for some family fun activities. 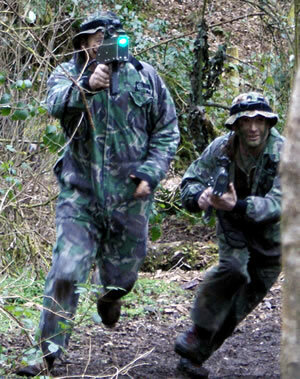 Whether you are young or just young at heart, Laser Skirmish is a fantastic idea for an outdoor experience. This is perfect for family bonding, especially for a special Father / Son day. All activities are run by professional Laser Skirmish referees. All you need to do is join in on the fun. If it just the two of you, check out our our Google Calendar for dates/times of public sessions. Book in your group and we will handle everything [call us to find out more PH 1300 666 559]. Just fill out the form & we'll get back to you. Plus we'll send you the FREE "7 Tips for Birthday Party Fun" checklist. If you are looking for a fun Father & Son activity (or Father & Daughter activity!) then Laser Skirmish could be just the ticket. With Laser Skirmish we offer you a fun, family-friendly environment. We have a special session dedicated to kids and parents playing and having fun together. This is a great idea for Dads and sons, Mums and daughters, or Mums/Sons and Dads/Daughters! Heck, this is fun for the whole family! Have a Huge Group? No Problem! Develop an "esprit de corps" a common spirit of comradeship, enthusiasm, and devotion to a cause among the members of the group. Inspire a "Carpe Deim" / "Seize the Day" attitude. Including a laser skirmish activity in a family fun day makes sense. Exciting and innovative family activities are tailored for your family's needs. The mixture of action and fun is awesome. Create a memory they'll never forget. Bookings essential. Please call to book on 1300 666 559.